For years, Panini's infamous Black Boxes have been synonymous with high-end industry events and giveaways. They became a brand without even having a mainstream release. Until now. 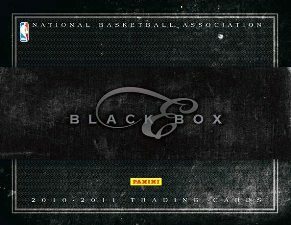 2010-11 Panini Elite Black Box Basketball boasts three autographs and two memorabilia cards per pack, as well as two limited inserts and one base card. 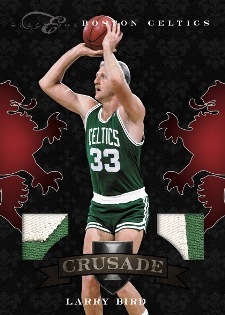 The high-end release is also notable for bringing the popular Crusade inserts to basketball, as well as Panini's first book cards for the sport. All autograph and memorabilia cards numbered to 149 or less; all inserts numbered to 99 or less. Champions Autographs (/10) feature five autographs from the 1969 Boston Celtics and 1980s Los Angeles Lakers teams. Crusade, an insert brand made popular in the late 1990s, appears for the first time in basketball. It's given a modern twist with memorabilia, autographed and autographed memorabilia versions, all of which are numbered to 149 or less. 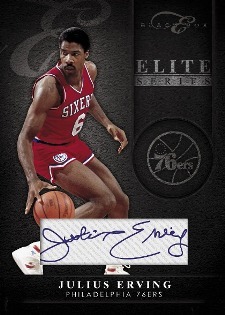 Elite Series Signatures (/49 or less) highlight some of the game's biggest stars. 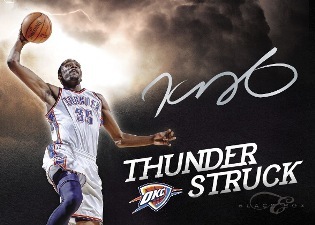 Kevin Durant gets his own insert set with Thunder Struck (/10), a ten-card set with on-card autographs. Passing the Torch include two autographs on a dual-sided card. Additional autograph inserts: Private Signings, Black & Blue, Flag Patches and USA Flag Patches (all feature on-card signatures). Booklet Cards (/25 or less). Forgot to rate product.. I rate overall 4, because I dislike sticker autos & off-centered autos.